Had a post from the owner with the following facts presented. OK as an Engineer I always feel Facts & Data are our friends. Note I suggest that in a perfect world that once you know your actual individual axle end load, you use the tables to find the minimum cold inflation and then add 10% to that number for your morning cold "set" pressure. For those smart enough to run TPMS, I would set the warning level to be the minimum cold inflation and not just the standard 20% below the morning "set" pressure. 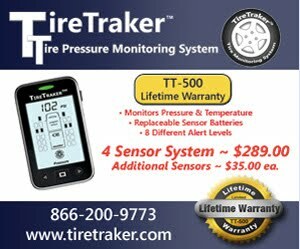 With the proper TPM system that gives not just the low pressure warning but also a rapid air loss warning you have a good chance of coming to a safe stop before damaging the tire or its mate from driving when officially flat i.e. having lost 20% from the minimum needed based on actual tire loading. Thanks for the straightforward explanation. I would add one comment and one question. Comment: It is also helpful for RVers to take into account the weight ratings for their wheels/rims when looking at inflation. My motorhome was built during a transition period and has a mixture of wheels rated at 120psi and 125 psi. Newer versions of the same wheel are rated at 130 psi. Also, if the tires aren't of the original size, the pressure ratings from the tire manufacturer might need adjusting if a different size rim is called for. Question: I've seen/heard the "add 10%" guideline mentioned many times but the rationale is unclear. If ad adjustment for side-to-side variation is already made, why not use the manufacturer's tables. Don't they know best? I have seen people overinflate for their wheels (125 psi on a 120 wheel) by doing this and one member of our group has reported abnormal center tread wear due to over inflation after doing this. If a margin is desired, wouldn't the tire manufacturers build it in to their tables? You are correct about not exceeding the ratings for the wheel. I have read elseware that the max load on the wheel may be more important than the cold inflation but have not seen hard data. The 10% is intended to eliminate the need for constantly adjusting the tire inflation. Imagine if you had a 49/51% side to side weight split. With that situation you would probably be selecting a cold inflation from the tables that was the same for Right and Left. Lets assume the tables indicate 100psi. The question them becomes what to do when the pressure rises or drops by 2 or 3 psi. Should you lower the pressure by 3 psi one day to get back to 100? What about when you drive from a cool area to a hotter one? Remember pressure changes 2% for every change on 10F. If you started to find you needed to add or drop air every other day I bet you would soon become complacent and not bother. This could result in a tire being overloaded. Adding 5 or 10% to the MINIMUM needed will help avoid "chasing your tail."